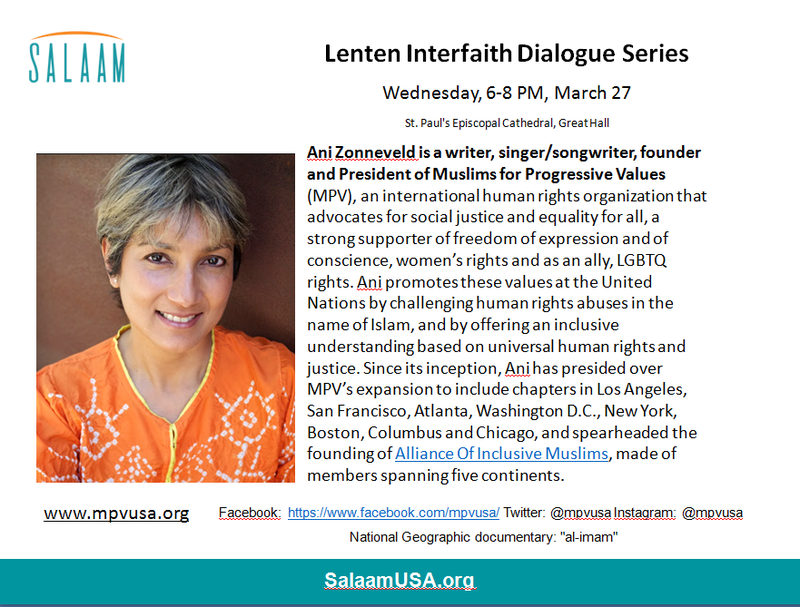 Ani Zonneveld will speak at this Lenten Interfaith dialogue series, which will meet on Wednesdays between March 6 and Easter. MPV’s President, Ani Zonneveld, will be speaking on a panel discussion, sharing her views on the positive and negative effects of hate speech by religious leaders. Ani will also share an outline of the workshop she designed for Office on Genocide Prevention and the Responsibility to Protect in empowering stakeholders toward reforming educational curriculum in Muslim societies. The event is sponsored by the Office of the Special Adviser on the Prevention of Genocide (OSAPG), and co-sponsored by UN WOMEN, UNFPA, UNAIDS and ACT Alliance. UN Women’s new Initiative Equality in Law for Women and Girls by 2030 will be launched at the 63rd meeting of the Commission on the Status of Women. MPV is a proud partner of this initiative, which aims at repealing or amending laws that discriminate against women and girls, and ensuring that laws are grounded in gender equality and women’s human rights. During the event, MPV’s President Ani Zonneveld will speak, sharing MVP’s strategic ideas in fulfilling this vision. The event is sponsored by UN Women Headquarters, African Union, the Commonwealth, Inter-Parliamentary Union, Organisation Internationale de la Francophonie, and Secretaría General Ibero-Americana. Symposium on Freedom of Religion or Beliefs, Cultural Rights and Women: Promoting a Gendered Perspective on Freedom of Thought, Conscience, and Religion. Join Muslims for Progressive Values (MPV) for an elegant affair in Los Angeles, Californ, as we honor the artists and activists from the Muslim world who have fought against human rights abuses, and sought to affirm the equal worth of all human beings. By celebrating and honoring these heroic defenders of#FreedomOfExpression and #FreedomOfConscience, MPV affirms that we can inspire others to do the same and continue to redefine the narrative of what it means to be Muslim. Be sure to reserve your tickets, soon! For further information, and a list of honorees, click here! Breaking stereotypes for transformed social norms on women and work: The role of men and boys and faith actors in achieving sustainable change for gender equality and women’s economic empowerment. MPV’s Ani Zonneveld will be a respondent. Roundtable, hosted by the Faith and Feminism Working Group (of which MPV is a member), featuring Special Rapporteur in the field of Cultural Rights, Karima Bennoune; discussion will draw from experience of key actors and ideas regarding advocacy, strategy and opportunities for collaboration on faith and feminism issues at the UN. MPV’s Omair Paul will be leading the round-table. MPV's president Ani Zonneveld is a speaker (and singer) on a panel: Women, a Pivotal Force for Change. Join MPV in celebration of Women's Rights Day at California State Fullerton University on women's issues from various women's perspective, which promises to be a very informative experience. The Impact of Fundamentalism and Extremism on Cultural Rights” a discussion in conjunction with the release of Special Rapporteur in the field of cultural rights Karima Bennoune’s report. Also on the panel are Magnus Ag (Freemuse), Samia Allalou (journalist, director), Professor Chetan Ghatt (Center for the Study of Human Rights), Alejandra Sarda-Chandiramani, and MPV’s Ani Zonneveld as moderator. Ask a Muslim: What is true Islam? With the toxic media and political narrative of Muslims feeding into a vitriolic atmosphere, it is time we come together for an open and honest discussion about Islam. What is true Islam? Who practices true Islam? Where do the extremists find the basis for their beliefs, and how have groups like ISIS perverted a long and steady religious tradition? And finally, how do we combat the atmosphere of violence and hate that has befallen our Muslim compatriots? Join us as we discuss these questions and more in our next “Ask A Muslim” panel discussion at the Founder’s Metropolitan Community Church in Los Angeles, CA on November 13th. Kenyatta Baker-Allgood - Born and raised in Los Angeles, California, Kenyatta hails from a family that has been instrumental in building the foundation of Islam in Los Angeles. Her parents were both educators who helped start and taught in Mohammad Schools and Sister Clara Muhammad Schools. Kenyatta holds a BA in Child Development and an MA in Early Childhood Education. She is in the initial stages of beginning her PhD in interreligious studies at Bayan Claremont Institute. Kenyatta currently serves as a Child Development Professor for the Los Angeles Community College District and National University as well as a consultant for child care centers and programs. She and her husband Marcus are members of LA Voice, an interfaith organization that has over 55 congregations that have been instrumental in changing Los Angeles for the better. They were successful in passing Proposition 47, which reduces 6 low level felonies to misdemeanors and gives people resources to help them in their overall life. Kenyatta is a Khateebah for The Women’s Mosque of America, and she serves as a member of the SoCal Muslim/Jewish Forum. 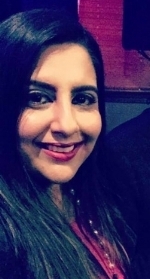 Crystal Keshawarz (Moderator) - Crystal is MPV’s Director of Communications, and combatting Islamophobia through peacemaking has been a key motivation in her work with the organization. She recently collaborated with Local Progress to present a referendum to end Islamophobia to West Hollywood’s City Council, which passed with a unanimous vote. Her work to bring MPV and its community partners together for a solidarity march and peace rally in Los Angeles was featured in Upworthy, and this December she will host the first international conference of Afghan Women in the Diaspora in London. She attended Arizona State University where she studied Political Science and International Studies. Hey Progressive Muslims! Come join MPV on election night as we watch the results come in live on a big screen at City Club Los Angeles! There will be some media coverage there that evening so come prepared to speak your truth and share your views! Or just come enjoy the mouth-watering sliders and an evening with friends! Please RSVP so that we can ensure you will have access to the club. Parking is $8 dollars in the garage after 4 pm. Since the tragedy in Orlando there has been a spotlight on homophobia within Muslim communities, the subsequent anti-Islam backlash, and the claim by conservative Muslim organizations that you are "either with us or against us." Ask A Muslim, the monthly series organized by The Markaz and Muslims for Progressive Values (MPV), presents an opportunity for an honest discussion about being LGBTQI and Muslim. This panel features Dr. Hamid Mavani, an Islamic scholar at Bayan Claremont, and Ani Zonneveld from MPV, with LA Times moderator Jaweed Kaleem. The conversation will review the realities faced by LGBTQI Muslims in the U.S. and abroad, and will discuss how mainstream Muslim organizations deal with homophobia. The panel will also discuss recent revelations pointing to the fact that there is an entire “Islamophobia industry” in the United States, funded to the tune of more than $200 million. THIS MEDIA CONFERENCE AND PANEL IS FREE AND OPEN TO THE PUBLIC. LIGHT REFRESHMENTS INCLUDED. THURSDAY, JULY 14TH, 7 PM, AT THE LA PRESS CLUB, 4773 HOLLYWOOD BLVD, LOS ANGELES, CA 90027 (JUST WEST OF VERMONT). AMPLE FREE LOT PARKING. Ask A Muslim is a new monthly series free and open to the public that addresses some of the most pressing questions surrounding Islam today. In a time when Islam is the subject of much discussion and controversy in the media, Ask A Muslim hopes to foster an ongoing open dialogue, in a safe space for debate, and promote a more informed understanding of Arab/Muslim cultures. Ask A Muslim engages the greater Los Angeles community across all religious, cultural and political boundaries, to foster public conversation about the Qur’an and what constitutes a compassionate, egalitarian and peaceful practice in all its manifestations, with the intention to dispel simplistic or stereotypical interpretations and vilification of the Muslim religion. PRESENTED BY THE LA PRESS CLUB, THE MARKAZ AND MUSLIMS FOR PROGRESSIVE VALUES. SPONSORED IN PART BY THE A & A FUND AND BANA & NABIL HILAL. THIS PANEL IS ALSO COSPONSORED BY THE HUMAN RIGHTS CAMPAIGN. The Markaz is L.A.’s Arts Center for the Greater Middle East, where arts and peace give voice to our dreams for peace. MPV’s mission is to embody and be an effective voice of the traditional Qur’anic ideals of human dignity, egalitarianism, compassion and social justice. Hamid Mavani is an Associate Professor of Islamic Studies at Bayan Claremont—Claremont School of Theology in California. His expertise in Islamic Studies stems from both academic training at universities as well as specialized theological training at the traditional seminaries in the Muslim world. His primary fields of interest include Islamic legal reform, women and Shi‘a law, Islamic theology and political thought, Islam and secularity, intra-Muslim discourse, and environmental ethics. 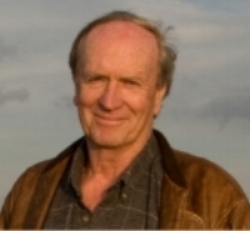 He is the author of a book published by Routledge in June 2013 titled,Religious Authority and Political Thought in Twlever Shi‘ism: From Ali to Post-Khomeini. Dr. Mavani’s scholarship also includes translations of Islamic texts from Arabic and Persian into English. His most recent translation from Persian to English is a work on jihad by Ayatollah Salehi Najafabadi, providing a novel and a creative re-reading of this much misunderstood concept. He is presently under contract with the Center for Islam and Religious Freedom (CIRF), translating a ground-breaking work by Ayatollah Mohsen Kadivar on Islam, apostasy, and blasphemy. Ani Zonneveld is founder and President of MPV. Since inception, Ani has presided over MPV’s expansion to include chapters and affiliates in 12 countries and 19 cities. She has organized numerous interfaith arts and music festivals, participated in many interfaith dialogues and is a strong supporter of human rights and freedom of expression. She is the brainchild of Literary Zikr – a project that counters radical Islam on-line and co-editor of MPV’s first book, an anthology titled “Progressive Muslim Identities – Personal Stories from the U.S. and Canada”; she has contributed to many forewords and numerous anthologies and is a contributor for Huffington Post, OpenDemocracy and al-Jazeera, and recently gave her TEDx talk titled – Islam: As American As Apple Pie. As an award winning singer/songwriter, she utilizes the power of music and the arts in countering radicalism as she speaks-sings her message of social justice and peace from a progressive Muslim woman’s perspective, and is the first woman to release an English Islamic pop album in the U.S. in 2004. Born and raised Muslim from Malaysia and based out of Los Angeles, Ani spent a good portion of her formative years raised in Germany, Egypt and India as an Ambassador’s daughter. Her exposure to different politics, religions and cultures has shaped her inclusive worldview. (Moderator) Jaweed Kaleem is the national race and justice reporter at the Los Angeles Times, where he writes about how race and ethnicity shape our evolving understanding of what it means to be American. Before joining The Times, Kaleem was the senior religion reporter at the Huffington Post for five years. From 2007 to 2011, he was a reporter for the Miami Herald. He attended Emerson College in Boston and grew up in Northern Virginia. Read an Al Jazeera article on the multimillion-dollar Islamophobia industry in the U.S.
Read an interview with 7 Muslim Americans. The event will share and discuss grassroots and state-level initiatives underway in changing societal mindsets on gender equality, human rights and women’s empowerment and participation in Muslim societies, particularly in working within the Islamic framework to reform discriminatory legislation and to counter harmful cultural practices. 1) The unique work on gender equality carried out by women spiritual leaders called “Morchidats” in Morocco. 3) MPV’s global initiative #ImamsForShe that collaborates with religious leaders in debunking misogynist interpretations of Islamic Scripture. The event will examine ways to foster these multi-faceted approaches to sustainably deconstruct patriarchal structures and build societies based on peace and gender parity. Women’s full access to meaningful participation in all realms of societal, economic and political life - as called for by the Women, Peace and Security Agenda - is only possible when the causes for gender discrimination and violence are dealt with at their root. MPV is hosting an informal consultation on #ImamsForShe at the United Nations in Geneva, after a successful launch event at the Commission on the Status of Women Session 59 in New York earlier this year. #ImamsForShe is an initiative to support and empower Imams, religious leaders and Islamic scholars who debunk misogynistic interpretations of Islamic scripture and traditions that have led to human rights violations against women and girls across Muslim-majority countries and within Muslim communities in the West. This private and informal consultation provides an opportunity for Imams, Muslim women's human rights activists and defenders, policy makers and NGO representatives to have a constructive discussion on strategic language and steps in bringing a positive change to those women and girls deprived of basic human dignity. Join us for an evocative night of creative aspirations to the divine. We will be coming together to connect various permutations of words, music and imagery, in an attempt to re-invent the culture of intellect through the synthesis of art, science and spirituality.